Lesson 1: Introduction Lesson - What Do I Do As A School Counselor? This week I came into the classroom and introduced myself to the students. I told students I was going to read them one of my favorite books of all time, Rainbow Fish. I asked that when I was reading, think about who in the story helps rainbow fish learn how to be happy. After reading the story, I explained that I am like the Octopus at this school because I help kids when they have problems. I explained ways in which I can help students by letting each student pull one object from my bag. As a student pulled an object from the bag, I let them explain to the class what the object is, and take a guess about what it could represent about my job as the school counselor. 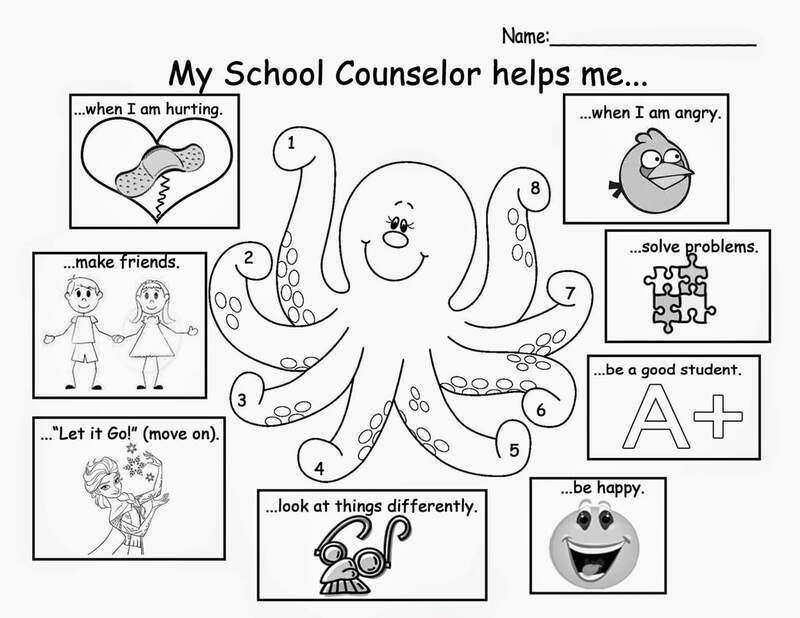 Once all of the objects were discussed, I gave the students a coloring worksheet that had a summary of the symbols that we talked about around an octopus. We talked about how to get help if they need to talk to me. This week students learned about emotional regulation. Emotional regulation means being able to think constructively about how to cope with feelings. We want children to have their feelings, but not be overwhelmed by them. I read the book, 'When Sophie Gets Angry, Really, Really Angry.' We discussed all the things that made Sophie angry and what she did to calm down. I then taught students about the 5 point scale. I shared with them that when they get to a "5" on the scale it is very difficult to be in control their emotions and their reactions to those emotions. We then discussed ways to cope when we are feeling ourselves move up that scale. Taking deep breaths, finding a 'calm down' spot in the room, discussing our feelings with a trusted adult, and drawing are a few of the many coping strategies we discussed. Students then came up with scenarios as a group and shared what strategies they would use to calm down. This week we talked about Bullying. I explained to students that Bullying is when someone hurts your body or feelings on purpose and it is happens over and over again. Next I read the story, 'Froggy Tames A Bully.' We discussed how Froggy helped Rolf Wolf when he was acting like a bully. Students then created a class 'Froggy' book that they get to keep in their classroom. This week we talked about the character trait Kindness. I read the story, "Potato Chip Champ." This book teaches kindness and empathy in a silly way with witty characters. I followed up with a random act of kindness activity.